Sometimes in life you meet special people and through my connections with Breakthrough Breast Cancer I have met Sarah-Jane Phillips who is a survivor of breast cancer. A very beautiful and charming woman who on first meeting you would think had never had a day's illness in her life. 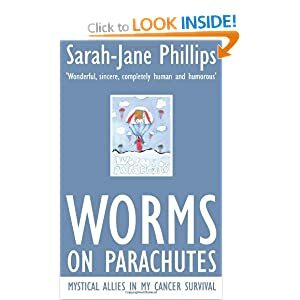 Her book,' Worms on Parachutes' is a story of survival and the journey through Hodgkin's disease, mantle radiotherapy, triple negative breast cancer, chemotherapy, double mastectomy and reconstruction. But it is more than that. It is a real-life story built around determination, courage and love. At times not easy to read, due to the subject matter, it is nonetheless written in such a friendly tone it is as if the author is just sitting in the room and having a conversation with you over a cup of tea, or in Sarah Jane's case eating a bar of Galaxy chocolate. Sarah Jane Phillips has written an informed , exposing, genuine real-life story that is more than just a legacy for her family. It is also a testament to the NHS and the team of medical professional whose dedication and expertise have made Sarah-Jane the person she is today. It is a reminder of how valuable the NHS is and how it should be cherished.In her introduction Sarah-Jane highlights that the proceeds of the sales of this book will go to the NHS. The title- 'Worms on Parachutes' I leave for the reader to find out, intriguing but understandable and endearing in context. This is an inspiring book for anyone who has had cancer or knows someone who has. It is an insight into what may happen and helpful in understanding how you as a friend or family can support someone on this path. Breast cancer is not a pretty disease, it does not happen in isolation. It is not just one part of the body that is involved, it is the whole body, mind and soul and this extends to the body of family and friends.